Part 4: Make Some Bubbles! STOP! If you have just arrived at this website looking for a hydroponic bubbler system, you might want to go back to page one of this mini-farm plan. 11. 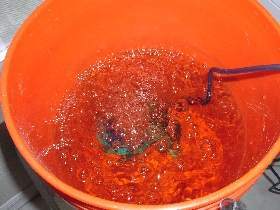 Drop in the airstone bubbler, connect to the air pump, and plug it in to test for a good rolling boil of bubbles. The bubbler with airstone stays on 24/7. This aerates the nutrient solution, keeping it from becoming stagnant, and oxygenates the root mass which will form in the bucket. Earlier we listed the cheapest supplies we could find, to help keep the cost of this setup low. However, you might want to go to a pet shop and buy an upgrade air pump for the stone. We bought the one below for $20 and it is super quiet! Also look for a circular airstone. This air pump has two outlet ports. 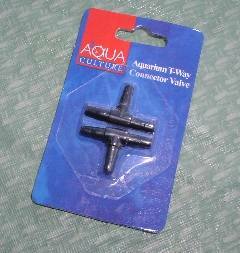 If you wanted to run two bubble buckets off one air pump, run a line off each port to the two different airstones. 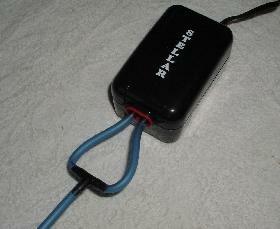 If you only want one bucket, then buy a “T” adapter and tie in both ports to one airstone. No use wasting half those precious bubbles! 12. Next, add a nutrient concentrate of choice, for 3 gallons of water. If you are using GH Flora Series (recommended), add 3 tsp. each of the Flora Grow, Flora Micro & Flora Bloom, (one at a time, in that order). Adjust the pH of the solution with a test kit (more on this, and ordering info, later). 1. Without aeration and movement (bubble action), water tends to stagnate and brew undesirable bacteria called anaerobes. These harmful bugs cause mold, root rot and other nasty plant diseases if left unchecked. The one best method of combating anaerobic infestation is to infuse the water with a healthy dose of oxygen, which an air stone and pump does very well. Anaerobes can only thrive in the absence of oxygen. So bubbling up your reservoir directly prevents anaerobic bacteria from taking root. * TIP: Add a teaspoon per gallon of hydrogen peroxide solution to your reservoir during change-out of nutrients to further combat these harmful invaders. Reason #2. Bubbles of air released into the nutrient solution turns the reservoir chamber into an "aeroponic zone", with high humidity and life-giving nutrients delivered right to the plants roots. This promotes a robust, thriving root system; and hence a healthy plant up top. *TIP: Keeping the nutrient solution cool (preferably 70 to 75°F) also keeps plants comfortable and retards bacterial growth.